It’s taken 10 days, five city officials, two layers, one environmentalist, extraordinary patience, and strained relationships with neighbors, but at last, the city has blessed our ‘replanting’ plans which beautify the community walkway, provide a modicum of privacy to my home, and a support a fledgling bird habitat. And along with the blessings was an agreement to keep the plantings no higher than the ridgeline of the house, and the neighbors ‘trim’ permit was rescinded. The costs were large by any standards, the emotional upheaval and grief ridiculous, and all of it unwarranted and stupid. Acts of deception and lies led to the wholesale chainsawing of a lovely 13 year old tree – which all had agreed to trim – not chop down. I’ll say it again .. the only thing I find to fear in Mexico are Americans who want to transplant their complicated lives to this lovely serene town. I sat by the sea this afternoon trying to figure out why this happened? What precipitated acts of bad judgment? In the end, I have to accept that I’ll never understand. Instead, I’ll watch as new plantings slowly fill the space that their predecessors once occupied, and thrill as the bird population rediscovers a habitat and sanctuary. As I finish that sentence, a stunning road runner leaps onto the garden wall, flicks his head side to side, spies the grasshopper he’s been chasing and takes off into the remaining tall tree. Yes, another wonder filled day. 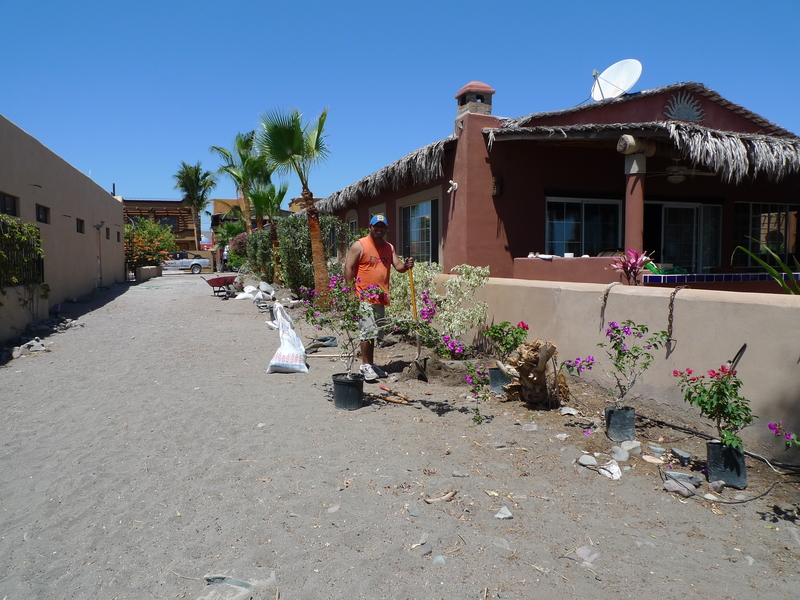 This entry was posted in Baja Living, Birds, Casa de Catalina, Gardens/Plants, Loreto. Bookmark the permalink.